The Browns ended a long coaching search by hiring their interim offensive coordinator Freddie Kitchens. It's a popular move inside and outside the locker room but is nonetheless surprising. CLEVELAND — Prepare to hear that Freddie Kitchens killed it in his interview. That the Ivy Leaguers in the room were wowed by his grasp of analytics. 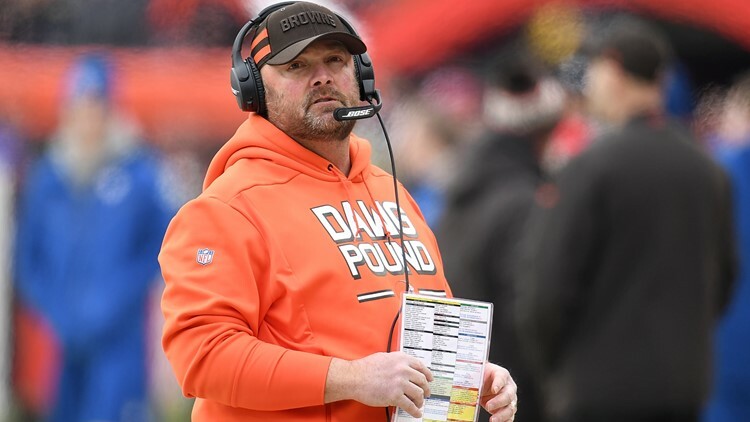 Whatever the spin, I suspect this hire is more about what the Browns saw of Kitchens’ offensive proficiency as a play caller -- no small thing in the NFL in 2019 -- and his relationship with quarterback Baker Mayfield. I’m not saying that’s a bad reason. In fact, it’s two good reasons. But they're betting big on the rest. And there's a lot more to the head coaching job. Only a few months after they determined the best interim head coach on the staff was Gregg Williams, they elevated Kitchens to permanence while watching Williams walk out the door. In the long parade of surprising Browns head coaching hires since 1999, a search that produced Kitchens and former Minnesota interim coordinator Kevin Stefanski as finalists for one of the best jobs in the league is stunning. All those times the Browns hired coaches other teams were not considering for their own head coaching vacancies? This was more of that. The difference is this time, the "exhaustive search” led them to an office in their own building. In hiring a coach already on staff, the Browns reduced the fear of the unknown but only by a tick. Will he call his own plays still? Isn't wearing two hats a lot to ask of any head coach let alone a rookie head coach? Are the Browns compromising what Kitchens does best if he doesn't call his own plays? There better be compelling reasons for Kitchens to be the choice beyond what he calls on third-and-12, because the job of head coach in the NFL demands it. At least that’s what Dorsey said when he listed the traits he considered most important to his search. “What do you want?” Dorsey said on Dec. 31. "You want a man of character. A guy who can instill leadership into these young men. A guy who is a collaborative thinker. A guy who is a continuous learner. “A guy who is consistent on a day in and day out basis and who those player can look up to and go, ‘You know what? I will follow that guy anywhere.’ "
It’s hard to believe that when Dorsey came here from Kansas City with his list of head coaching candidates, that Kitchens or Kevin Stefanski for that matter were on it. But give Dorsey this much. “Lists change all the time,” he said late last month. If Kitchens was truly Dorsey’s No. 1 target — and I heard three weeks ago Gregg Williams was not going to get the job and that the front office loved Kitchens — the hire should feel even better to Browns fans. If keep-Kitchens-at-all-cost was an ownership mandate and that sentiment in any way compromised the head coaching search, oh boy. Here we go again. As for Kitchens proficiency in doing a job far bigger than emergency offensive coordinator, we’ll find out soon enough.